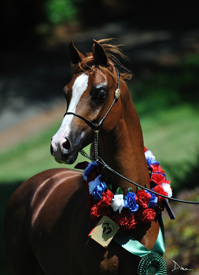 2010 Chestnut Gelding AHR 647855 SOLD! With the arrival of this special colt, Maplewood goes back to its foundation. G is our fifth generation, tracing to the first mare we purchased under the guidance of Greg Fratt (then the Patterson’s breeding manager). To complete the circle for today’s show horse, we went back to Afire Bey V, who had found a niche in our program bred to our Polish mares. This would be our third Afir Bey V foal. The foals from crossing Erykk’s paternal sisters to Afire Bey had proved our belief that this cross was a good bet. As it turns out – G underscores the compatibility of generations of Polish warhorse breeding of might-and-bone matched with the elegance of Afire Bey V’s predictable “front end.” One look at G and we knew he inherited both. G’s neck was so perfectly structured to wear a bridle from his early days that it was difficult to find a foal halter that fit. His neck bent so tightly at the poll and his head nestled so perpendicularly that even a knotted baby halter would fall to the base of his neck and restrict his freedom to exercise. He is undefeated in Oregon Yearling and two-year-old Futurities and was a Top Five Region IV Breeders Sweepstakes Yearling Colt. Always bright, always fired up and gifted with Afire Bey V’s show ring look, G is ready to be in a Nationals-bound show string. He is a Breeders Sweepstakes entry and is eligible for the AEPA 3-4 year-old Performance Futurity. This entry was posted in Champions, Opportunity on October 15, 2013 by Anita Enander.